We kept it simple. A fresh approach to making Italian Herb Spaghetti sauce. You've probably heard the saying "keep it simple." And that's what we try to do with Italian herb spaghetti sauce. It's easy to make and easy to follow without sacrificing flavor. Open a can of tomato paste, add water and Simply Organic Italian Herb Spaghetti sauce mix, let it simmer until it reached the desired thickness. Now your ready to tackle the Spaghetti Al dente. 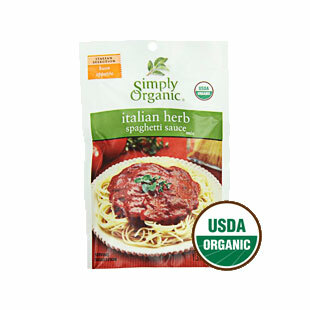 Simply Organic Italian Herb Spaghetti Sauce Mix has the perfect assortment of organic Italian seasonings for making "homemade" spaghetti sauce. QAI Certified Organic and Kosher: KSA Certified. And is Gluten-Free.